Bangko Sentral ng Pilipinas (BSP) data shows that Overseas Filipino Workers remittances in 2017 amounted to $ 25.318 billion. Being called as "modern heroes", OFWs continue to keep the Philippine economy afloat while providing the needs of theitr family back home. The government has formulated and implement different programs and assistance for them through OWWA and other government entities as an appreciation for what their sector has been doing for the nation . 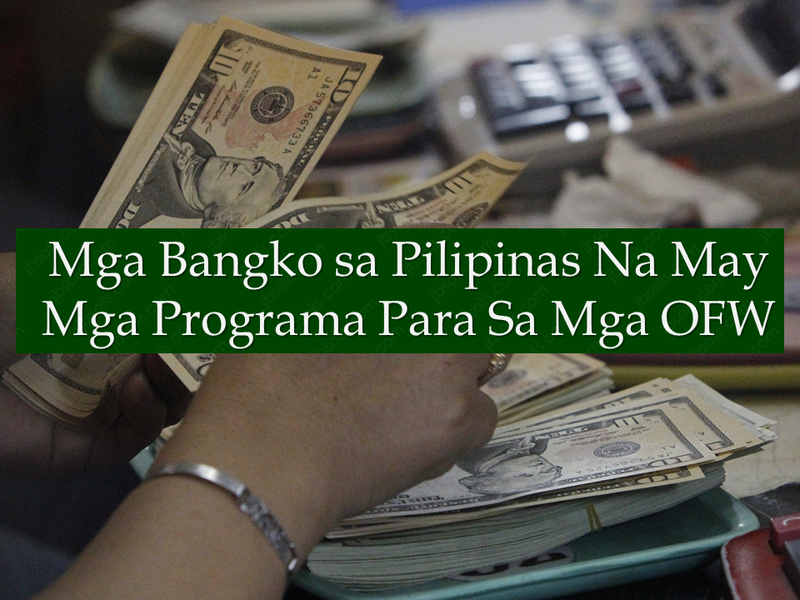 Aside from government efforts to help the OFW, there are private financial institutions that offer loan packages specifically designed for OFWs. BPI offers variety of loan options both for land-based and sea-based OFWs such as Personal Loan up to P1 million, Housing Loan, and Auto Loan. Visit www.bpiloans.com to apply online. BDO established the Asenso Kabayan Program which provide financial assistance to OFWs who want to apply for a home, auto, or personal loan. Overseas Kababayan Services from Chinabank is a loan program which provides secure, reliable, and competitive products that allow you to manage your remittances, investments, and personal needs. For more information about their loan facilities visit www.chinabank.ph. PNB came up with Global Filipino program which offers auto loan and home loan for OFWs even when they are working overseas through their branches abroad. To know more about PNB’s Global Filipino program here. PSBank is also committed in providing OFWs with facilities that could enhance their lives. From the usual savings account and remittance programs, PSBank also has home and car loan products for OFWs. Check out PSBank’s loan facilities in their website. RCBC got a wide range of loan programs for OFWs that comes with flexible terms as well to make payment easier and more convenient. You can learn more about RCBC’s consumer loans by checking out their website. For more information about loans and other facilities and products, we suugest that you go directly to any branches of the aforementioned banks to further understand their programs.